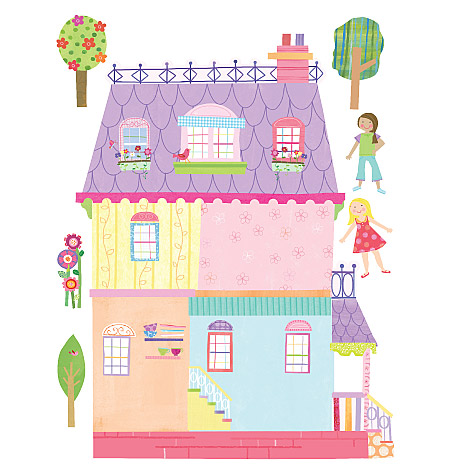 Let your daughter create her own play house paradise with these easy-to-use, decorate-it-yourself Wallies Play House Wall Play wall decals. Starting with the house as a base, you and your child will have fun adding the furniture and landscaping to create her own unique sense of style. Want to change it up? Redecorating is a breeze as you simply remove and reposition the Play House Wall Play pieces to create a whole new look for more interactive, decorating fun. Wallies Play House Wall Play wall decals let children be the decorators of their own domains... and they can have great fun while they're at it. No water, no mess. 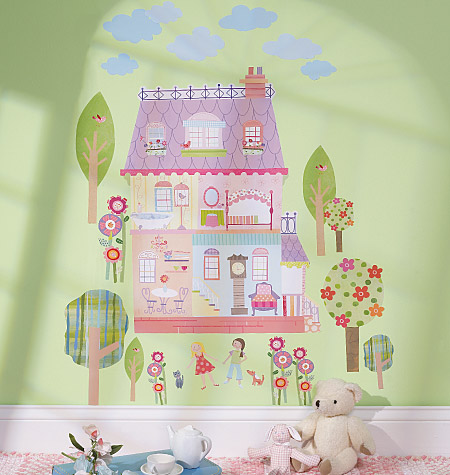 Just peel the wall stickers off the backing and stick them to the wall to bring whimsical decor into your home in minutes. 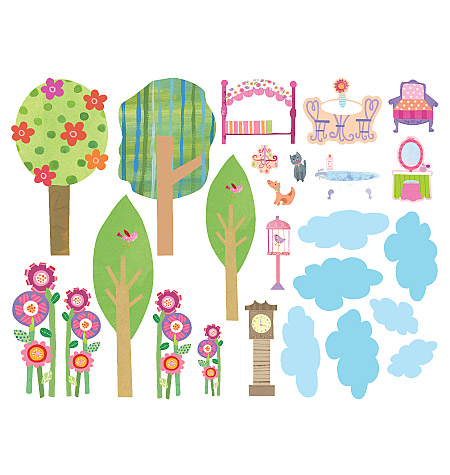 Made of durable, self-adhesive backed vinyl that can be removed and repositioned easily, this Play House peel and stick Wall Play mini mural set will not harm or damage surfaces or leave a sticky residue. Note: Recommended for no- or low- textured surfaces. House 16.25" x 21.75"; Friends 3" x 4.75"; Pets 1" x 1.75" to 1.5" x 1.5"; Flowers 2.5" x 3" to 2" x 6"; Trees 2.25" x 4.5" to 3.5" x 11.5"; Furniture 1.5" x 1.5" to 5.25" x 2"; Clouds 3" x 1.75" to 5" x 3"